After watching Harvey decimate a large portion of southeast TX, the storm has finally started shifting northeast. In its sights... the Mid-South. Fortunately nothing like what occurred in Houston and surrounding areas will occur here, but we'll definitely feel the effects. Let's get into it. A Flash Flood Watch will go into effect Wednesday afternoon and continue into Friday. The initial feed band of showers and a few thunderstorms will arrive Wednesday morning, though it won't be the main event. However, as with any rain originating from a tropical system, downpours are likely. By afternoon, we'll be in a pattern favoring scattered showers and thunderstorms, though it won't be a washout. Rain chances will go up dramatically Wednesday night, especially as we approach Thursday morning. Heavy rain chances go up and the wind will start to pick up a bit, increasing to about 15 mph from the east. Thursday is "Washout Day" as the heaviest of the rain on the north side of the storm moves over the region. 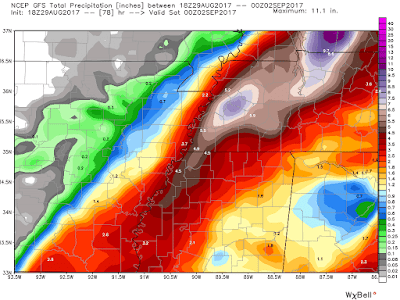 A couple of inches of rain are likely Thursday with very heavy rainfall rates in convective bands that sweep through. Wind will increase during the day and become gusty to 25-30 mph. Flash flooding becomes more likely in areas prone to ponding and flooding, especially in the concrete jungle. 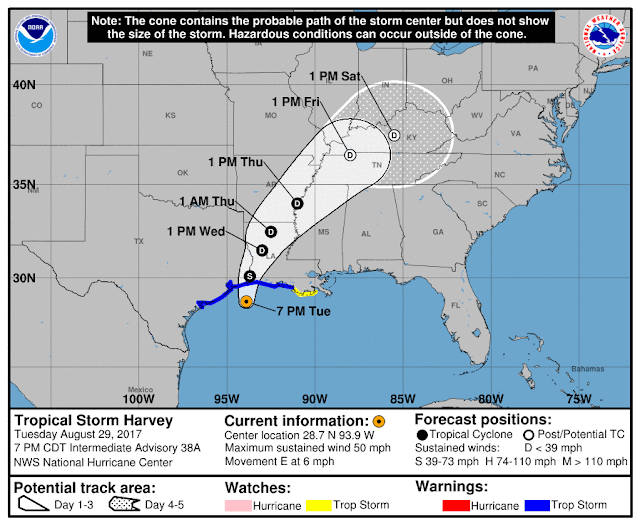 By Thursday night, as the Memphis Tigers open their season at the Liberty Bowl against Louisiana-Monroe at 8pm, rain will still be falling but models are starting to indicate that the rain may be tapering as the evening goes on, as low pressure from Harvey moves near or just east of the metro. As the vast majority of the heavy rain will be north and west of the low, once the low passes by to our north, rain chances drop quickly. So besides rooting for the Tigers, we need to root for a faster motion of the low! Wind will shift to the north but remain gusty to 30+ mph Thursday evening. The other potentially good news is that the primary threat from isolated spin-up tornadoes is east of the low, therefore that threat appears to be minimized in the metro. As far as preparation, plan ahead for significant rainfall Wednesday night through Thursday night with the potential for flash flooding and urban flooding. Make sure storm drains are cleared tomorrow around your home. Also you will want to secure lightweight objects outdoors that could blow around in 30-35 mph wind. Looking ahead, with the faster motion of Harvey, we look to be drying out heading into the holiday weekend! In fact, Friday could end up being dry but breezy with comfortable temperatures. The Labor Day weekend looks great weather-wise with highs in the 80s and dry conditions. The next chance of rain arrives Tuesday with another frontal system reinforcing the below average temperatures we've experienced for most of August.